With the centenary of the Armistice tomorrow it seems fitting to briefly re-visit the tradition of mistletoe as a symbol of peace – which is now often overlooked. Tradition holds that the Romans considered mistletoe a plant of parley, and that opposing armies would negotiate peace treaties under a mistletoe growth. This may, or may not, be strictly true but I doubt mistletoe played an active role in the 1918 peace negotiations. 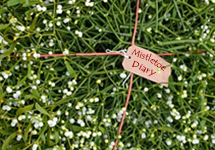 Other traditions also reference mistletoe as a plant of peace; some versions of the Norse Baldur legend, in which Baldur is slain with a mistletoe-tipped weapon, suggest that his mother Frigga (a goddess of love) decreed that mistletoe must never do such harm ever again – and she proclaimed that all who meet under it henceforth will embrace and be friends. The Greek legend of Aeneas visiting the Underworld also reflects an element of mistletoe as a peace symbol, with Aeneas using mistletoe, aka The Golden Bough, to gain safe passage to and from Hades. These aspects of mistletoe tradition are rarely mentioned today – most people simply remember it as a symbol of love, friendship and romance. These are, of course, merely a variation on the same theme. The peace symbolism was perhaps remembered in mainland Europe longer than in the UK, with a strong tradition of mistletoe as a plant of good luck – a Porte Bonheur – in France well into the 20th century and maybe still today. The French New Year greeting Au Gui L’An Neuf relates to the giving of mistletoe as a good luck gift for the New Year. But, getting back to peace itself, could it be that mistletoe actively seen as a peace symbol – particularly in the awful reality of the Great War? This was, after all, fought on land where mistletoe was still valued for its luck and peace properties. It’s difficult to be sure – but there is a fair amount of mistletoe imagery amongst pictures of the time, including several sets where soldiers wear mistletoe in their hats. I rather doubt they were expecting to kiss anyone so it seems more likely they wore it for luck. There was also use of mistletoe imagery in postcards sent back from the front – some specifically themed as Peace or Luck – so perhaps those are real proof of the ongoing, at that time, belief in mistletoe as a peace/luck symbol. But the evidence is patchy, and those postcards could be coincidental use of mistletoe, as a Christmas symbol, simply being used in a postcard sent at Christmas. “Pray remember, Captain, that I come here as a cooing dove of peace, bearing a sprig of mistletoe in my beak – but far be it from me to stand in the way of military necessity”. Was that reference to a mistletoe sprig (rather than an olive branch) merely because it was Christmas – or did Churchill understand that mistletoe was also a plant of peace? If you want to grow your own plant of peace and luck why not buy a Mistletoe Grow-Kit (or Grow-Kit Gift Card) from the English Mistletoe Shop? Previous Post Mistletoe ‘crop’ 2018 – looking good, ripening early?